An ‘expression of concern’ letter was sent last week by the EU Digital Agenda Commissioner Neelie Kroes to the Hungarian government concerning Hungary’s new Media Law. The sustained response by the government (if you eliminate sound bites that they will change the law if asked – they will only do this if other EU members states do), is the current law does correspond with EU directives. However, I fail to see how, after reading the letter from the Commissioner the Hungarian government can be comfortable with the current law. And to not realize that further investigation is coming. I suggest to read the letter – it really is great. Sometimes it is hard to maintain a middle of the road analysis when democracy is undermined. I can only hope that like most inside and outside of Hungary, that the Hungarian government finds its way back to the democratic path – and not consider official investigative letters from the Commission as something to brush off. Why is transparency important to the energy sector? This is from a project that I’m working on right now. It is from one of the participants. It really goes to the heart of why the energy sector is so important and why there needs to be transparency and predictability in the sector. Both things that are being eroded in our current economic and political times. In many countries, the energy sector is a large percent of overall national GDP. Plus, energy is a fundamental building block of any economy in any society. Light, heat, cooling and power, and are critical for homes, schools, universities, laboratories, shops, commercial establishments, offices, and industries. Without safe, secure, reliable, and reasonably priced energy, societies are broken. Because of the massive importance of a functioning energy sector, the significant amounts of cash that flows through the sector on a daily basis, the important role of agencies, such as regulators, and due to the inherent monopoly nature of core portions of energy networks, transparency is critical. The public – consumers, ratepayers, taxpayers, business enterprises – need to have confidence that in a regulated environment, publicly appointed regulators are making decisions that are free of corruption, consistent with governing laws and regulations, reasonably predictable, understandable, and done without political interference, all to the maximum extent feasible. Things are super busy here at Limax Energy, so all I have time to state is a simple observation. It appears that Hungary’s EU Presidency and focus on energy is shaping up to simply confirm the plans that are already on the drawing board for gas interconnectors in the CEE region. Check out the below video of Hungarian Prime Minister Viktor Orban laying out this interconnector priority ( at 10 minutes in) and on arrangement for an energy summit. It seems like the Hungarians have taken an easy issue that was already moving along after the 2009 Russian/Ukraine gas dispute and put it out there as one of their key accomplishments. Maybe this is why there were rumors before that MOL was being told by the Hungarian government not to rush into constructing the gas interconnector with Slovakia late in 2010. And here I was thinking it was because of the Russians – but as I said then, it still didn’t make sense. But I think it does now, they are using this already agreed upon interconnector as proof that they have advanced energy security of supply in the CEE region. Nothing like claiming credit for stuff that is naturally happening. Also, in the video, PM Orban points out that they are waiting for the Poles to move ahead with the interconnector to Slovakia. Well, here is the press report detailing that this is already moving ahead, regardless of Hungary’s EU presidency. It appears that Orban will proclaim success in June for uniting Central Europe’s gas infrastructure through a grandiose interconnector plan. Too bad it was already well underway before he took over the Presidency. If he was a true ‘revolutionary’ as he proclaims himself to be, then he might create some goals that are harder to achieve, like ensuring the success of increasing energy efficiency in the EU – which also appears to be on the plate for diplomats at the upcoming EU energy summit. Decreasing energy demand is equal to, or even more important, than building new interconnectors. I just hope that the other priority concerning the Roma people turns out better. Hungary is not ‘discriminative against foreign firms’ – really? 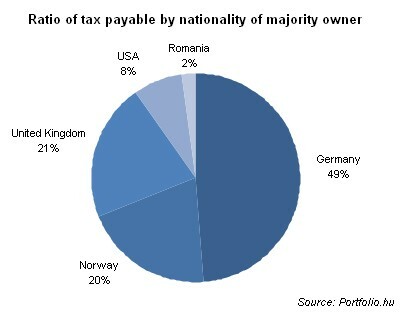 “I firmly reject that these taxes would be against foreigners … it is not true that this regulation is discriminative and against foreign (firms),” Hungarian EU affairs state secretary Eniko Gyori told reporters. (Reuters article). 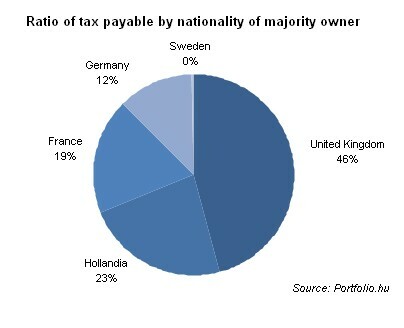 My only response is to repost the following graphs displaying the nationality of companies affected by the ‘crisis tax’. Please note, the tax on energy companies does not include the ‘Robin Hood’ tax that was also extended. It just seems that Fidesz’s European view looks more like this, rather than the reality reflected in these graphs. The question extending back to last spring’s election that brought Fidesz to power, is how will they find the money to buy Surgutneftegaz’s 22% shareholding in MOL. Well, since my analysis has been spot on, that nothing is going to happen, because the Hungarians have the Russians pinned. It now seems the Hungarians are becoming increasingly embarrassed by their strong position over their former rulers – as they are increasingly trying to find ways to let the Russians save face – I have a solution. I need to preface my solution with a warning, that this wouldn’t work in most democratic countries. But recent legislation by Hungary’s government from killing the independent budget council, changing the constitutions to limit the constitutional court, taking all the pension fund money, passing highly questionable media legislation, placing a huge revenue tax on utilities, telecoms and retail companies (regardless if they make a profit and from previous year’s filings) and of course passing a 98% tax retroactive 5 years on state bonuses. Indicates that my suggestion just may work. From these actions a basic statement can be formulated: Hungary right now may become the first post-soviet country to pursue alternative democratic measures. That is, in Chinese, there are different democratic models that can be used by the state. Hungary, it can be said, is embarking not just on an ‘unusual economic experiment’, as Prime Minister Orban and others in his cabinet have said, but they are also starting an experiment in representational democracy. Due to these existing conditions, my suggestion to solving the MOL/Hungary -Surgutneftegaz/Russia situation is all the more applicable. Recently, I have been involved in separate projects that have allowed me to study the energy sector in Central Asia. It really is fascinating – while at the same time sad when you consider the actions of the political leadership and the impact their decisions have on the economically starved citizens (I won’t yet draw parallels with Hungary here). It is through this research that I found the following solution to funding a hyrdopower project in Tajikistan. 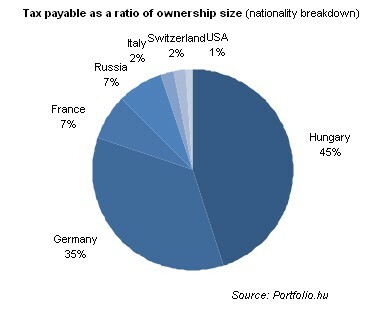 Now it remains to be seen where Hungary could get the money to buy out the MOL shares from Surgutneftegaz. Particularly since funding is becoming more expensive for Hungary – with the constant downgrading and negative outlooks by ratings agencies a further indication of funding access in the future. Therefore, how best to finance a purchase of MOL shares valued at more than EUR 1.4 billion (the price paid by Surgut to OMV)? And since it has been stated by Hungary’s leadership that ownership in MOL (and other energy companies) is connected to national security than what better way of financing the purchase then to force Hungarians to pay for it themselves?! With Hungarians increasing their savings (no doubt related to uncertain times), it only becomes a matter of time before the government taps into this pile of money to finance current operations – or to ‘ensure the security of the country’s energy supply’. MOL will then have to wonder whether it is better to have the Russians as a shareholder or the unpredictable Hungarian government. If this scenario does play out then we can only hope it ends up like the Tajik experience, with the IMF/EU stepping in to stabilize the Hungarian economy and putting the kabash on the further ‘reallocation’ of money for energy projects. Or maybe we can look forward to a third ‘special’ tax on the energy sector….